Now that spring is finally here, it is time to start thinking about lighter dishes, such as Quiche Lorraine. Originally from Lorraine in France, this dish has always been a favourite of picnics and summer buffets. Serve with a green salad, and a chilled glass of white wine. Just the thing to get you in the mood for the coming summer! Serves 4-6. Add the beaten egg and continue to process. The mixture should be just moist enough to come together. If making the pastry by hand, rub the butter into the flour until it resembles breadcrumbs then, using your hands, add just enough egg to bring it together. With your hands, flatten out the ball of dough until it is about 2cm thick, then wrap it in cling film, and leave in the fridge for at least 30 minutes before using it. Line a 20cm high-sided tart tin or dish with the shortcrust pastry, prick the sides and base of the pastry with a fork. Cover the base with a circle of baking parchment. Fill the tin with baking beans and bake blind for 10-15 minutes. Remove the beans and parchment for the last five minutes of baking for a golden crust. Heat a non-stick sauté pan and cook the pancetta for 5-6 minutes, or until crisp.You should not need any extra oil as the pancetta will release enough fat to cook it. Sweat the onions gently in the same fat for a further ten minutes, or until softened. Add the crème fraiche and the milk along with the salt and pepper and mix together well. Mix together the onions and pancetta and spread this in a layer on the pastry. Next sprinkle the cheeses in a second layer over the onion and pancetta. Then sprinkle the chives over the top of the cheese. 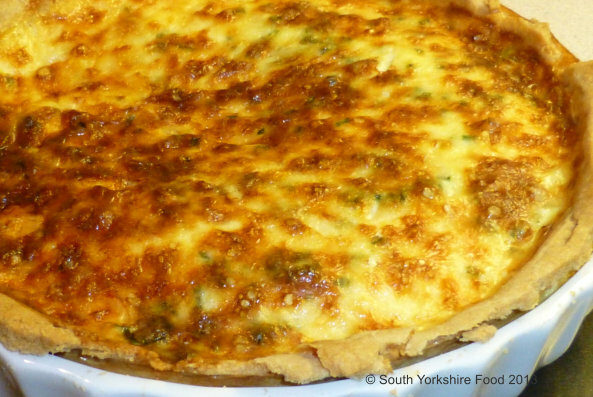 Pour the filling into the pastry base, place the quiche dish on a tray, and return to the oven to bake for 3040 minutes, or until the centre has set. Serve warm with a green salad and relish.